Bonfire of the Vanities: Combine old Mass and new? Pope Francis offering the new Mass ad orientem in Sistine Chapel. An article I read this morning from the Catholic Herald about the manner in which the Roman liturgy was reformed in the wake of the council -- provoking an ongoing "hermeneutic of rupture" -- reminded me of a thought experiment from the other day, when I had a long drive home with plenty of time to think. Before I get to that, first let me unfold the meaning of the "hermeneutic of rupture," which I agree is exactly what happened, and explains to a great degree all that is so weird and otherwise incomprehensible that happened in the life of the Church since the Second Vatican Council. Why were churches wrecked? Artwork and beauty destroyed? Why don't newer churches look like churches? (Actually, they are starting to, again; but this question refers to many churches built between around 1970-2000.) And so on. You know the questions; they may be your questions. The hinge is the term "hermeneutic," which means a principle of interpretation. Is the interpretive key you apply to the documents of the council one of rupture and discontinuity? Or is it one of continuity and organic transition? (2a) The Council couldn't call for it openly, so it wrote its documents in deliberately ambiguous language, expecting the post-conciliar work to go where they didn't dare go. (3) Yeah, all that seems disruptive happened, but that's really an organic development anyway, and it's just that you're too delicate and hidebound to realize it. (4) We don't really care about Vatican II; we only care about what we have now, which we like better. By the way, if you think I'm making up any of these responses, I am not. I have seen and heard them made in various settings, by laypeople, clergy and supposed "experts." There are a lot of folks who are heavily invested in a hermeneutic of rupture -- both emotionally and financially invested -- and so they will defend their position to the uttermost. In any case, back to the liturgy. Pope Benedict's entire approach to the sacred liturgy embodies the "hermeneutic of continuity," and it is my own as well. And it was in pursuit of a long-term reconciliation that he freed the celebration of the older form of the Holy Mass. So back to my thought-experiment. Recently I found myself wondering: if there were some sort of "merger" between the older form and newer, what might it look like? I hasten to point out: while the rubrics of the new Mass are loose enough in places that some of this may be possible, it's pretty clear that this entire scheme I am about to unfold would be illicit; so don't do it! (My headline is meant to be provocative, not a recommendation.) But it's fine as a thought-experiment. It helps to realize four features I presuppose in what follows that can be realized right now: a church that is structured in the traditional way; use of Latin predominating; traditional vestments and sacred vessels; and ad orientem posture--that is, the priest facing the Lord, with the people, rather than "turning around" to offer the sacrifice. These are all perfectly licit in the new Mass; the extent to which they've become rare is a consequence of the misbegotten "hermeneutic of rupture" described above. To help show where the ideas come from, I'll use italics to denote a distinctive feature of the older form, and bold to indicate something definitely from the new. Note well: if I don't add either, that means what I'm describing is actually true--right now--of both. After the priest vests with all the traditional items, including the maniple and biretta (note: allowed right now), he enters led by the ministers in cassock and surplice. In a "high" Mass, the choir/assembly sings the Introit in Latin or the vernacular. He approaches the altar, perhaps placing the chalice on it, and at the foot of the altar he and the servers recite the "foot of the altar" prayers. In a Mass without anything sung, the assembly might join in, or else listen. These prayers might be in the vernacular. 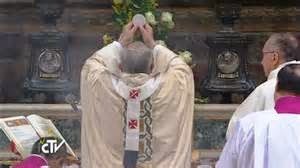 In a "high" Mass, the priest might then proceed with incense; in any case, he then kisses the altar, and -- if not already sung, recites the Introit, vernacular permitted. He then goes directly to the chair, and facing the altar, leads the Kyrie and Gloria in Latin or in the vernacular. After leading the collect, he sits down as a lector proclaims the first reading and the gradual or tract from the pulpit, the vernacular permitted. Following this, the priest or deacon goes from the chair, facing the altar and tabernacle, bowing to reciting the prayers beforehand. Then he proclaims the Gospel from the pulpit. The readings could be chanted in a high Mass. When desired, there would be an option for proclaiming the Gospel in the traditional manner, "toward the north." If proclaimed in Latin, it would be read again, in English, at the pulpit. Now the priest, assisted by the deacon and ministers, using the offertory prayers from the older form, places the bread and wine on the altar. He keeps the bread on the paten. Incense follows in a high Mass, including the traditional prayers with the server giving the called-for responses. (I think a priest himself might licitly pray the traditional incense prayers at this point in the new Mass.) He turns for the "orate fratres" which can be in the vernacular. He prays the offertory collect aloud, and then proceeds with the dialogue and the preface, recited or sung aloud. The Roman Canon is normally silent, with or without music overlaid (Note: there are those who argue that this is permissible in the new Mass; I have heard the argument, but cannot here reproduce it). The rubrics would give permission to offer it aloud "occasionally." The signs of the cross omitted in the new form would be restored. The Mystery of Faith would be intoned as in the new form, except where use of a traditional Mass setting made it impractical; in which case, the priest would say it sotto voce. The priest would lead the people in singing or reciting the Pater. The Libera nos would follow, in silence, with the gestures with the paten omitted; the priest would bow and recite, silently, all three prayers preparing for communion (note: in the new Mass, one of these is recited aloud; and one of the two can be omitted). The priest would turn and give the Pax Domini. There is no other "sign of peace." (Note: the sign of peace as currently practiced is, actully optional.) The priest would then lead the Agnus Dei aloud if it is not sung. Then the priest leads the Domine, non sum dignus three times. What do you think? No doubt I have glossed over some of the fine points. I have, for example, not mentioned many of the gestures and movements particular to the old-form solemn high Mass, because I'm not so familiar with them, and not really wedded to them. Feel free to address that in the comments. This looks great!! Would that we lived closer to you. Hello from Scotland, Father. Might it not be appropriate to reintroduce the double genuflection at the consecration of the host and the wine? A double genuflection, you say? I'm totally unfamiliar with that, in regard to the moments of consecration. The people are already kneeling, on both knees I presume; and the rubrics of the older form as of 1962 call for the priest to genuflect on one knee only. I am aware of it for Exposition. Can you please explain? I'm confused about your use of the term "reintroduction." I’ve thought of another option, one that I’ve not seen proposed anywhere else. The existing 1962 Mass, the Extraordinary Form of the Roman Rite, in the vernacular with optional Latin prayers. I believe he is referring to the genuflection immediately after the consecration and again after the elevation, as in the TLM as a double genuflection. If I lived closer than an 8 hour drive I would love to attend. For what it is worth I believe this is the way Holy Mass will usually be celebrated in the average parish in 40 years. The TLM or EF Mass will still be around as well. Only the Orthodox Catholics are having children and they will be the source of most of the new vocations to priesthood. God does call whom He wishes. I believe something very similar is doable now even if we have to tolerate the ‘unsat’ NO offertory. Be assured you and all holy priests are in my prayers! I believe that is the 1964 Missal. It is my prayer that we will continue to see a return to a hermeneutic of continuity...pray for the Church, and pray for her daily. We can have that unity in the Mass when doctrines are in continuity with the past. This will be possible in future when they identify the false premise used in the interpretation of magisterial texts, including the Catechism of the Catholic Church. No, Cardinal Ratzinger did not make a mistake. If you follow the link, you will see the mistake identified as the Catechism's statement: "God is not limited to the Sacraments." And Catholicmission asks, "Why did Ratzinger say this? He said it because it's true. Did Aquinas make a mistake when he said the same? Did Augustine? It takes a lot of sand for a latter-day blogger to assert that Ratzinger, Aquinas and Augustine (not to mention many others who held the same) are all wrong, and the said blogger, alone, is right. And, to top it all off, Catholicmission's post blames all this on Vatican II! A council in the 1960s caused Augustine and Aquinas both to err, across the span of centuries into the past? What won't these folks blame the Council for? Vatican Council II no where says God is not limited to the Sacraments. One has to infer it, wrongly! The dogma defined three times by three Church Councils says all need to enter the Church for salvation. This is corroborated by Vatican Council II (Ad Gentes 7) and this was the traditional teachiing of the Catholic Church until the time of St.Maximillian Kolbe. We can see it in his writings. So why does the Catechism says 'God is not limited to the Sacraments'? There is no visible exception in 2014. Neither does any Church document before 1949 state that the baptism of desire is not implicit, subjective and invisible but explicit, objective and visible. So why did Cardinal Ratzinger make this objective error? We cannot see the dead and no tradtional text before 1949 infers this. Aquinas and Augustine no where infer that the dead are visible to us.They held the traditional interpretation of extra ecclesiam nulla salus. They did not state that there were visible in the flesh exceptions. The man in the forest who is saved in invincible ignorance would have a preacher sent to him said St.Thomas Aquinas. Since all who are in heaven are there with the baptism of water. Similarly St. Augustine affirmed the traditional interpretation of the dogma, the 'Feeneyite' version. He did not claim that the baptism of desire is an exception to the dogma. Similarlay I affirm the possibility of being saved with the baptism of desire etc ( followed by the baptism of water). However I will not infer that the baptism of desire is an exception to extra ecclesiam nulla salus. Any one who alleges that we humans, in general ,can see the dead is wrong. He is irrational even if he is the pope. And, to top it all off, Catholicmission's post blames all this on Vatican II! False. Vatican Council II without the visible- dead- who- are- exceptions premise is traditional. I support a traditional Vatican Council II which is not a rupture with the past.There is no irrational premise used in this interpretation. The Council text is neutral. A council in the 1960s caused Augustine and Aquinas both to err, across the span of centuries into the past? What won't these folks blame the Council for? The Council is in perfect agreement with Augustine and Aquinas.It is traditional. Vatican Council II without the irrational premise is not in agreement with a Catechism which states God is not limited to the Sacraments. Your post on your site claims that Ratzinger made a mistake in saying, "God is not limited to the sacraments." I'm not interested in all this blizzard of words about "seeing the dead." That's a red herring. Do you stand by your assertion that the statement, "God is not limited to the sacraments" is a "mistake"? De facto ( in real life) God is limited to the Sacraments.This is a de fide, dogmatic teaching ( Cantate Domino, Council of Florence 1441 extra ecclesiam nulla salus etc).Vatican Council II also says all need faith and baptism for salvation(AG 7). May be I could elaborate. In the present times every one needs the baptism of water for salvation. De facto every one needs the baptism of water for salvation. In 2014 every one needs the baptism of water for salvation and there are no known exceptions. In the words of Vatican Council II all need faith and baptism for salvation(AG 7). In the words of the Catechism of the Catholic Church 846 all need to enter the Church as through a door and CCC 1257 God knows of no means to eternal beatitude other than the baptism of water. When CCC 1258 etc says that a person can be saved with implicit desire or in invincible ignorance it is correct.It is referring to an implicit for us case.It is a possibility known only to God. This is not a defacto case, personally known. So far so good . There is no problem here as Catholics we can accept A and B as long as we make the distinction between implicit and explicit, invisible and visible. The problem arises when CCC 1257 infers that B is explicit, objective, defacto known in the present times and is a known exception to A. This is irrational.Vatican Council II does not make this claim in any text. The error comes from the Letter of the Holy Office 1949. So I can affirm A and I would be accepting Vatican Council II and I can affirm B ( as implicit for us) and I would be accepting the Catechism of the Catholic Church 846,845,1257. CCC 1257 would be accepted when it states everyone needs the baptism of water. God is limited to the Sacraments according to the dogma extra ecclesiam nulla salus. CCC 846 refers to the aphorism outside the church there is no salvation. It was not an aphorism it was a dogma!! 'for those to whom the Gospel has been proclaimed and who have had the possibility of asking for this sacrament'. The above statment is hypothetical. These cases are not known to us on earth.So they cannot be relevant to all needing the baptism of water for salvation. Yes he is bound to the Sacraments as 1257 itself says that baptism is necessry for all.This is taught by the Holy Spirit. CCC 1257 is double talk, irrational and non traditional.It contradicts the teaching of the Holy Spirit over the centuries. Where does the Catholic Church teach that the baptism of Blood and of Desire are physically visible and known to us in the present times (2014) ? Why did the Holy Office 1949 mention the baptism of desire as an exception to the dogma? This is a factual mistake. Thomas Aquinas, who the Church -- apparently erroneously -- deems a saint, taught that God is not limited to the sacraments. You maintain they taught error. We are all in your debt for showing us that Aquinas and Augustine were in error, while you are correct! It is useful to use the terms de facto-dejure,explicit-implicit,hypothetical-in fact etc. So I could say that St.Thomas Aquinas taught that all needed to defacto enter the Church with the baptism of water.CCC 1257 confirms this. St.Thomas Aquinas taught that there could be a man, in invincible ignorance, in the forest saved, when God will send a preacher to teach him the Faith and to baptise him.So all those who are in Heaven for St.Thomas Aquinas, are Catholics who have received the Sacraments. Secondly, those saved in invincible ignorance (with or without the baptism of water, whatever be the arguement) are hypothetical cases for us in 2014. They can only be accepted de jure ( in principle). Hypothetical cases cannot be exceptions to all needing the baptism of water for salvation (CCC 1257). So CCC 1257 has double talk. The error is in assuming there is known salvation outside the Catholic Church.Neither did Aquinas or Augustine affirm this.This would be heresy. It would be a rejection of the de fide teaching on salvation. I am affirming Aquinas and Augustine and Vatican Council II with no defacto-dejure, explicit-implicit mix up. Wait, what else did he say there? "God, Whose power is not tied to visible sacraments..."
Which statement you labeled as "error." Was it likewise "error" when Aquinas said it? This too is a "yes" or "no" answer. No need to fuzz things up with a blizzard of words, as you've consistently done here. Just answer the question, yes or no: was Aquinas in error here? Here is St.Thomas Aquinas on the neccesity of the baptism of water for salvation.No where does he state that there are de facto exceptions to all needing the baptism of water. We have this passage through the courtesy of Fr.Martin Fox. Here is the Catechism of the Catholic Church affirming St. Thomas Aquinas 'God has bound salvation to the sacrament of Baptism' but then also saying 'but he himself is not bound by his sacraments.' It then says ' (1258)This Baptism of blood, like the desire for Baptism, brings about the fruits of Baptism without being a sacrament.' In other words the baptism of water is not needed in certain cases.There are exceptions. Move over St.Thomas! There are exceptions? Yes the Catechism (1257,1258,1259,1260) says there are defacto exceptions to all needing the baptism of water as mentioned by St.Thomas Aquinas. The Catechism says 'For catechumens who die before their Baptism, their explicit desire to receive it, together with repentance for their sins, and charity, assures them the salvation that they were not able to receive through the sacrament. ' So the Nicene Creed says 'I believe in one baptism for the forgiveness of sin' but now we have three baptisms. Then of course there are more 'baptisms' mentioned in Vatican Council II.They are being saved with 'the seeds of the Word' (AG 11), ' a ray of the Truth'(NA 2) etc. Here is the Catechism of the Catholic Church with the conflicting positions, which contradict the Nicene Creed and the dogma extra ecclesiam nulla salus. I fully understand why you want to change the subject. You said: "CARDINAL JOSEPH RATZINGER MADE AN OBJECTIVE ERROR"
"God is not limited to the Sacraments"
I've just shown that St. Thomas Aquinas said the same thing, in almost the same words. I asked you to please explain why Ratzinger's statement is "error" and Thomas' is not. This link no where says what you state.I have explained it here. The link which you provided only confirms what I have been saying. No where does St.Thomas Aquinas say there are exceptions to the baptism of desire. Also what you have mentioned above on St.Augustine could you provide the exact text? I have just quoted the same text and for me St.Thomas said that the baptism of water is ALWAYS needed. Cardinal Ratzinger is in error since he is contradicted by St.Thomas Aquinas in the Summa according to the link you provided me. Secondly, even if St.Thomas Aquinas and St.Augustine said as you say that the baptism of desire and blood are exceptions to all needing the baptism of water, then it means that they are saying that these cases are visible to us in actual life. If they are exceptions to they would have to be known to us. Are you still saying that these saints said that we can see the dead now in Heaven who are defacto exceptions to extra ecclesiam nulla salus? Is this rational and real for you? This should read The link which you provided only confirms what I have been saying. No where does St.Thomas Aquinas say there are exceptions to the baptism of water. This is why it's pointless to argue with a Feeneyite. They are either dishonest, or simply incapable of dialogue for a hidden, non-moral reason. Because of your (a) dishonesty or (b) incapacity, please keep your Feeneyite nonsense off my site. It didn't belong in this thread to begin with, but I tolerated it, in (vain) hopes you'd actually enter into a conversation. Now that I see that's impossible, I'd rather you just keep it on your site. If and when I decide to do a post on Feeneyism or related topics, then have at it. Until then, please comment on-topic, or not at all. The issue is related to the Holy Mass,Fr.Martin.With which doctrine will we celebreate the Novus Ordo or Traditional Latin Mass in future ? 1.Do I assume Vatican Council II (AG 7) contradicts LG 16 ( as in your case) or it does not ( as for me). 2.Do I attend Holy Mass in Italian or Englaish knowing that CCC 1257 contradicts CCC 1258 etc( as in your case) or that CCC 1258 are acceptable as implcit for us and so not a contradiction( as in my case)?. Apply the same reasoning to the Nicene Creed. When is a sin of faith a mortal sin and who is in a mortal sin and should be wary before receiving the Eucharist or celebrating Holy Mass ?. Fr.Martin I have tried to answer some of the points you have mentioned above. It is here in this post. It is common knowledge that we cannot see the dead who are in Heaven. CCC 1257-1260 infers that we can! One more try and then that's it. "God is not limited to the sacraments." I'm telling you that Aquinas said virtually the same thing. I quoted it above. If you respond, respond by addressing this ONE AND ONLY ONE issue. Not "seeing the dead." Whatever the merits of that topic, I did not intend to ask about that, and at this moment, that is not my concern. Please address how Ratzinger's quoted statement above can be wrong, but not Aquinas. If you don't want to address that ONE AND ONLY topic, then there's no need to respond at all. This implies that there is known salvation outside the Church and so ...God is not limited to the Sacraments. It implies that the baptism of desire and being saved in invincible ignorance (CCC 1258-1260) are visible in the flesh in 2014 for them to be exceptions to all needing the baptism of water for salvation.So God is not limited to the Sacraments. This is false since we do not know any person in 2014 who is an exception to all needing the baptism of water. It is false since no magisterial text before 1949 claims we know such persons in real life. It is false since no magisterial text before the Letter of the Holy Office 1949 claims that there are known exceptions to extra ecclesiam nulla salus. So how can it be said God is not limited to the sacraments when there is no New Revelation in the Catholic Church to contradict the thrice defined dogma extra ecclesiam nulla salus. It is wrong since it would contradict Vatican Council II (AG 7) and the Catechism itself (846,1257). It contradicts St.Thomas Aquinas who says the baptism of water is always needed for salvation.He never claimed that there were known exceptions to the dogma extra ecclesiam nulla salus. This is a non traditional ( opposed to Aquinas and Augustine),irrational and heretical ( contradicting the Nicene Creed and the dogma on salvation) statement. Thank you for stating your position. "some have received the invisible sanctification without visible sacraments, and to their profit; but though it is possible to have the visible sanctification, consisting in a visible sacrament, without the invisible sanctification, it will be to no profit." Your answer should be one word. 'some have received the invisible sanctification without visible sacraments, and to their profit; but though it is possible to have the visible sanctification, consisting in a visible sacrament, without the invisible sanctification, it will be to no profit." 'some have received the invisible sanctification without visible sacraments, and to their profit'.This is irrelevant to the dogma extra ecclesiam nulla salus and the need for all to receive the baptism of water. Since we do not know and cannot know any such case in 2014.It is hypothetical. Even if it is correct, as it is meaningful for you, what bearing does it have on all needing the baptism of water for salvation in 2014 and there are no exceptions? So even if there was such a case one could not say 'God is not limited to the Sacraments' since this case would not be part of the reality of Cardinal Ratzinger. Upon a hypothetical case he cannot reject a de fide teaching which says God has bound salvation to the Sacraments. Fr.Martin the Feeneyism which you have referred to above is related to the Catechism and Vatican Council II. If the Franciscan Friars of the Immaculate who offer the Novus Ordo and Traditional Latin Mass, interpret the Catechism and Vatican Council II as Feeneyites, then they can endorse Tradition and also the Council. Without the false premise they can have it both ways.It would not violate the Principle of Non Contradiction. They can affirm the dogma extra ecclesiam nulla salus and also implicit for us baptism of desire, invisible for us being saved in invincible ignorance etc. Presently,like you Fr.Martin, most of them interpret the Council and Catechism with the irratioinal premise(except for a few of them).So the Council comes across as a break with the past and then reject it. They are misled by the line 'God is not limited to the Sacraments' as referring to real, visible exceptions.This is irrational. Your argument isn't with me, but Saint Thomas Aquinas, whose writing I have quoted several times in this thread, and which it's crystal clear you really don't comprehend. I really have nothing better to offer than his words. You are welcome to have the last word, as I will offer nothing more on this. If you said that St.Thomas Aquinas contradicts the Catechism of the Catholic Church's 'God is not limited to the Sacraments' wouldn't it be a threat to your career. And if you said that the Catechism of the Catholic Church and Vatican Council II are Feeneyite could you still be a priest in good standing? And if you were rational and said that you cannot see with the naked eye any exceptions to the dogma extra ecclesiam nulla salus, would they allow you to offer Holy Mass. Speaking the truth,proclaiming the Truth has consequences. It's easier for me as a layman. Thanks for talking about it,at least.I understand your motives are good.